It seems like just a few days since I last wrote about the activities surrounding Fly Cup Catering, but it has been six weeks, and here I am once again with my fingers on the keyboard. Welcome to Edition 3 of "The Natter"
You will remember from my last edition how much we enjoyed decorating the Christmas cakes for our customers. So what more excuse did we need than to get the ribbon out again and help our customers with their little surprise valentines presents. 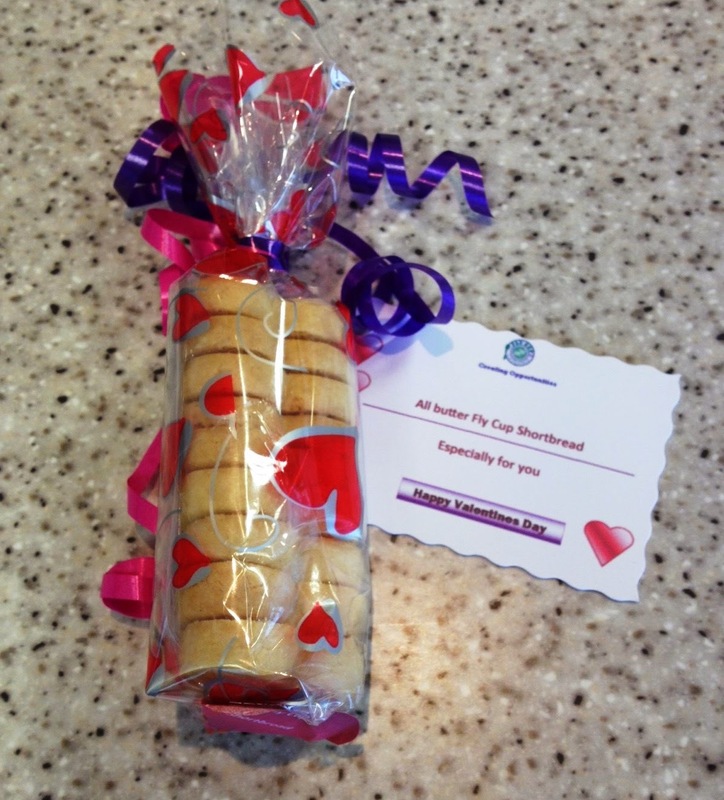 These lovely packed Fly Cup Shortbread Hearts were very popular with our coffee shop customers, I think a few of took them home for loved ones as well. 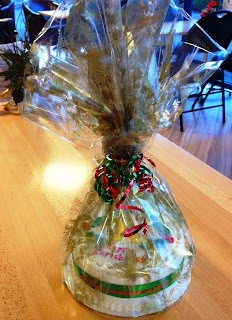 I must give everyone credit though, because it isn't just the bakery that is being creative. Our trainees, supported by the staff team, have been tasked with preparing and cooking the lunch time specials a couple of times a week. Customers have been tempted by Sausage Pasta Bake, Chilli and Baked Potato and Savoury Croissants during the past few weeks. 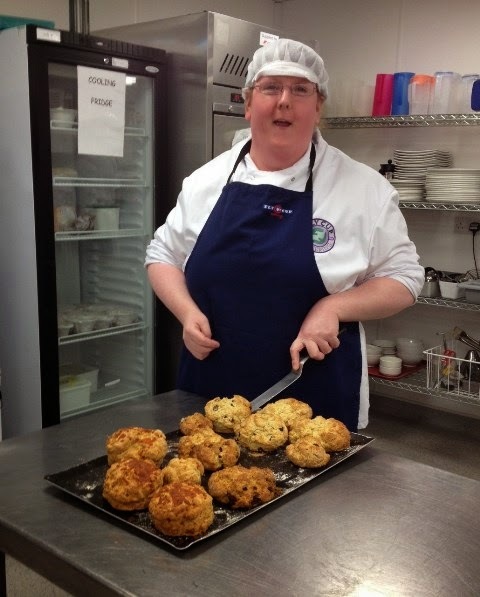 Nicola and the trainees in the kitchen are also responsible for outside catering orders, the choices included mixed sandwich platters, soup, sausage rolls and healthy fruit. 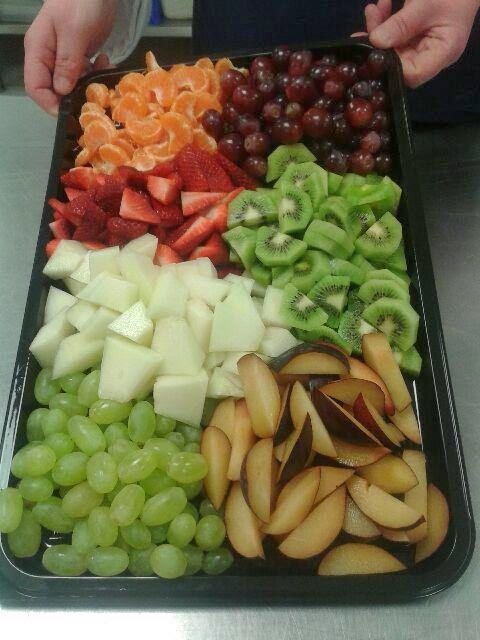 This platter was delivered recently to a local organisation, I hope the recipients enjoyed it ! 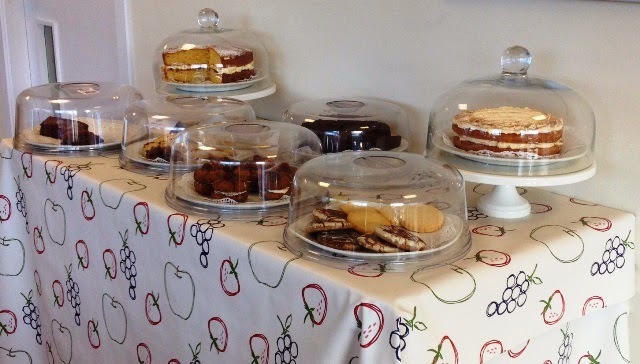 With the growing creativity in the bakery, the coffee shop is bursting with delicious cakes such as Chocolate and Marble Madeira Cake, Victoria Sponge, Ginger Load and Fruit Cake. This week I notice that scrummy looking Viennese fingers had found their way onto the table, Oh and the cheesecake, yummy ! (don't you pit my poor waist-line). However, do not fret, the tray bakes are still in abundance and the morning smell and taste of fresh baked scones can still be experienced on a daily basis. Not just a coffee Shop ! As you are aware Fly Cup Catering has been supported by Marks and Spencer's Fundraising team for the past year and at the beginning of February, Julie and her team brought life to the Coffee Shop on A Friday evening when they hosted a Bingo and Stovie night. A first for our coffee shop, it turned out to be an excellent venue raising a staggering £612.00 toward Fly Cup funds. The support from our trainees, customers and families was excellent. It was especially nice to see that Fly Cup trainees were winners throughout the evening, with Yvonne scoring on the Bingo and Moira on the Raffle. Although, Coffee Shop staff member Katrina was the star of the show with two Bingo wins - well done to everyone and thank you for your support. 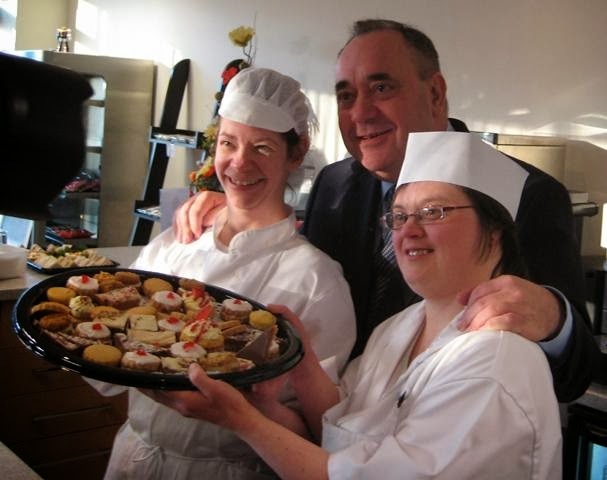 At the beginning of March, Aberdeenshire Council funded Fly Cup Catering to provide an afternoon of food and fun which would help to establish whether there is a requirement for a regular social and befriending afternoon for older people living in and around Inverurie. The afternoon was advertised locally and we had over 50 people booking to come along. Unfortunately we could only invite 30 and had to put everyone else on a waiting list. Since the lunch I have completed an application form for funds to run such events on a regular basis. I will let you know how we get on. 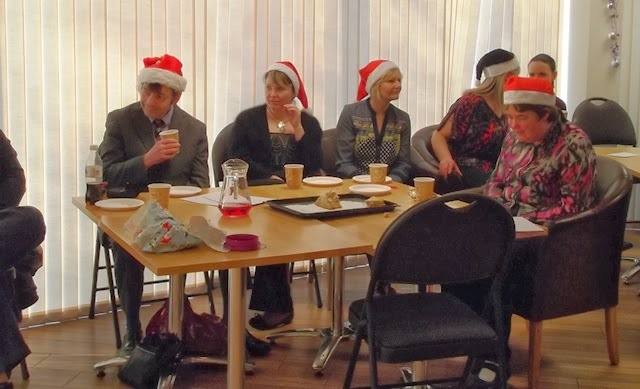 Following the successful "Lunch on the Fly" the team have been investigating ways in which we may increase the use of the facilities available in the coffee shop outside opening hours. I was delighted on Friday evening to welcome a private booking from three ladies who had been on the journey of a lifetime and wanted to share the experience with their friends and colleagues. Their guests, some who were making their first visit to the Fly Cup, were entertained with a talk, finger food and drinks and a (Audrey special) Victoria Sponge. Although I was hidden away in my office writing this edition of "The Natter" the sounds of ooh and ahh coming from the coffee shop, followed by laughter told me that the ladies in question had enjoyed quiet a fund time on their world tour. There is certainly an opportunity for Fly Cup Coffee shop to be used at times other than Monday to Friday during the day, if you would like to discus with me any networking, private dining, children's party or fundraising events, then please do not hesitate to get in touch. I know you will not be disappointed. You - supporting our Charity. Following my last "Natter" we can now show off our new coffee shop aprons, with our logo embroidered on them, thank you to Jenny Beattie for the donation and to Moira (Pictured) for modelling. A very generous gift of a laptop and desktop has been received from one of our trainees parents. Paul Skinazi was good enough to donate the equipment along with a black and white laser printer. I thank you so much, Carol and I cannot wait to have the new software installed and be able to part with the computers we are currently using, which, although served us well, really do need replacing. As a charity we could not function without grant funding such as those awards I have written about in previous issues of "The Natter" and whenever we (The Management team and I) write a grant funding application we can identify exactly how the money would be used. 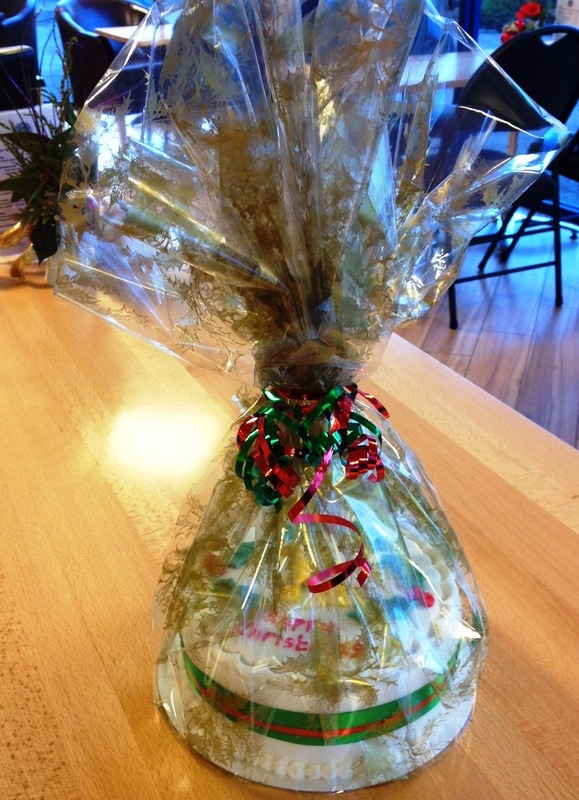 But, the donations and small gifts that we receive from our customers and friends make the difference when it comes to alternative and sundry needs. Each month the donations box is counted and all ad-hoc funding (including fundraising events) is ring fenced for much wished for equipment and resources. As we draw t the end of the financial year, it is time to spend the surplus donated funds and therefore I am currently revisiting the desired list, which includes steam cleaners / hoovers and other cleaning paraphernalia. Watch this space for an update in the next edition. We are appreciative of all donations, thank you everyone for your generosity. It is surprising how quickly things change at Fly Cup, with regard to staff and volunteers. 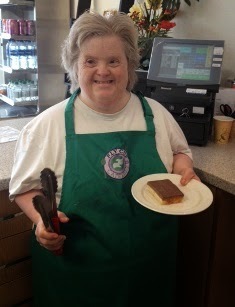 Audrey, who had been working in the coffee shop on Thursdays and Fridays decided that she would like to spend the days in the bakery where she felt better suited. As a result, Claire (who I mentioned in Edition 2) moved into the slot vacated by Audrey in the Coffee Shop. Consequently, there was suddenly a gap left by Claire, who had been floating around the various departments helping out wherever needed. Just when I thought the customers would have to serve themselves, a few angels appeared. 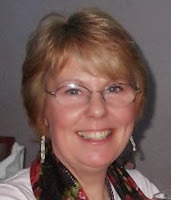 We have been delighted to welcome Janette to our volunteer team. Janette joins us each Monday and has already proved to be a huge help, I recently discovered her at the ironing board, spotted her in the coffee shop and then a little while later up to her elbows in hot water at the sink. 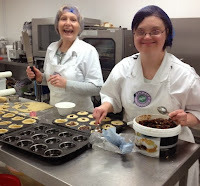 There are always opportunities for volunteers at Fly Cup, and in addition to Janette, I know the bakery department are absolutely thrilled with their new volunteer. 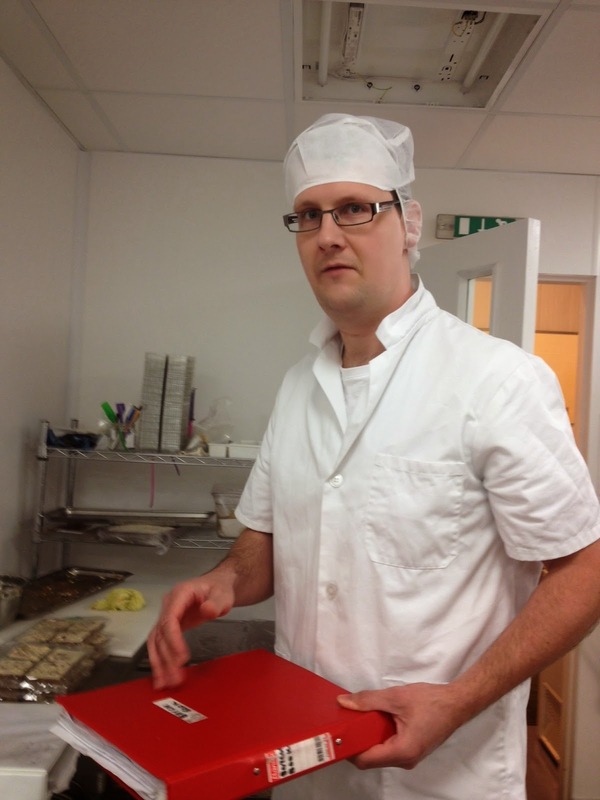 Paul has taken to the challenge of working in a busy department with enthusiasm and ease. 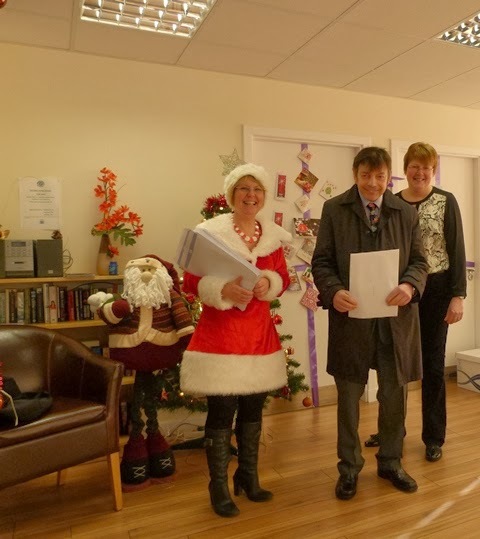 His efforts are much appreciated by Helen, Audrey and June when he joins them twice a week. 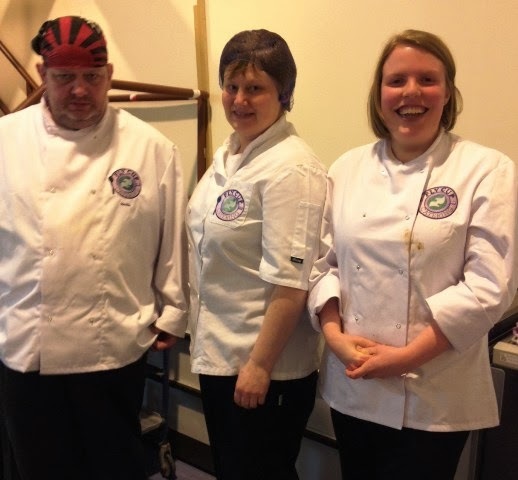 Fly Cup Catering is here to provide training, learning and employment opportunities for adults with learning difficulties. We are so proud of them as they progress through each stage of a training programme. 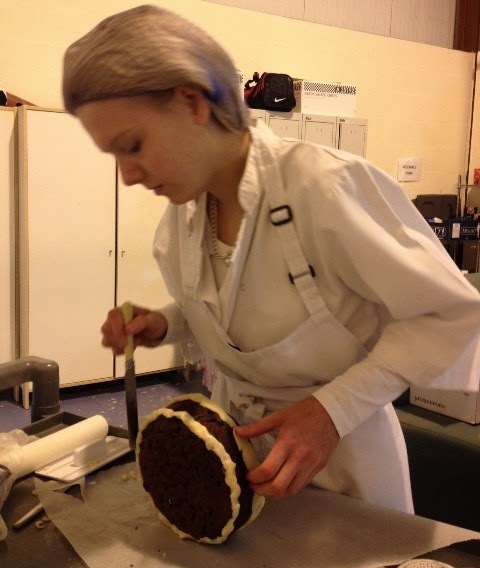 The young people are always learning something new, whether as part of an NVQ supported by Lorraine from the college who visits our premises weekly, or our own Fly Cup modules supported in-house by staff. They all work very hard and deserve the certificates they achieve. keep up the great work guys, you are doing fabulous. ! As March comes to an end so does our relationship with the fundraising team from Marks and Spencer. As Julie and her group move onto their new venture we would like to thank them so much for the support they have given us during this past year. The final total of money raised will be announced over the coming weeks and I will update here next issue. However, a couple of events before we part company, on March 23rd a Quiz Night here at Fly Cup will be followed by a Bag Pack on 29th at the Inverurie Store. Anyone wishing to get involved should contact me as soon as possible. The bakery is now produce a range of bakes, and we have displayed them in a different way, let us know what you think ! Until my next "Natter" take care, and if you are in the Coffee Shop remember to say hello ! A little belated, but the whole team at Fly Cup would like to wish all our customers, past, present and future a very happy 2014. The last, which was also the first edition of "The Natter" included an introduction to a new member of our Fly Cup Catering team June Falkiner. June arrived during December and was straight away introduced to the Christmas Mince Pie order sheet. 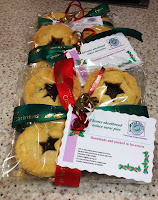 If you ate one, I can almost guarantee it was made by our trainees with the help of June. Nicole decorated my cake for me. As well as Mince Pie we provided over a dozen hand made Christmas Cakes, each one unique, baked and decorated on-site by staff with the help of trainees. I can confirm that the cake which was made and decorated with the help of Nicole, was absolutely delicious and I have eaten my way through it over the past few weeks. In addition, to all the retail products of pies and cakes, the coffee shop was very busy, with over 110 people enjoyed a festive meal of either two or four courses. Sean and Keri laid the Christmas table. Our trainees were very involved in all aspects of the lunches, from preparing vegetables, laying tables and serving our customers. 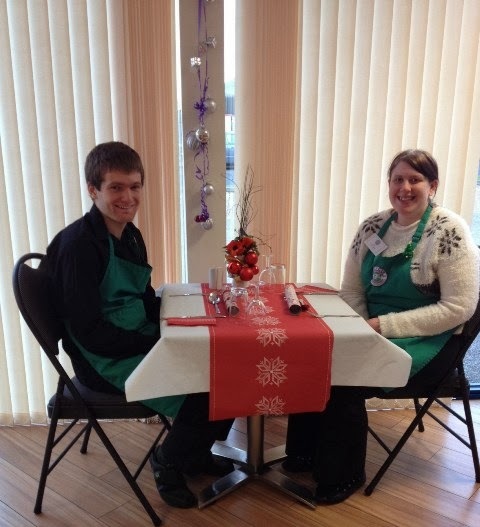 As you can see from the picture, Keri and Sean would very much liked to have been having a lunch, but on this occasion they were just laying the table. Feedback from our customers was lovely, thank you for your support. 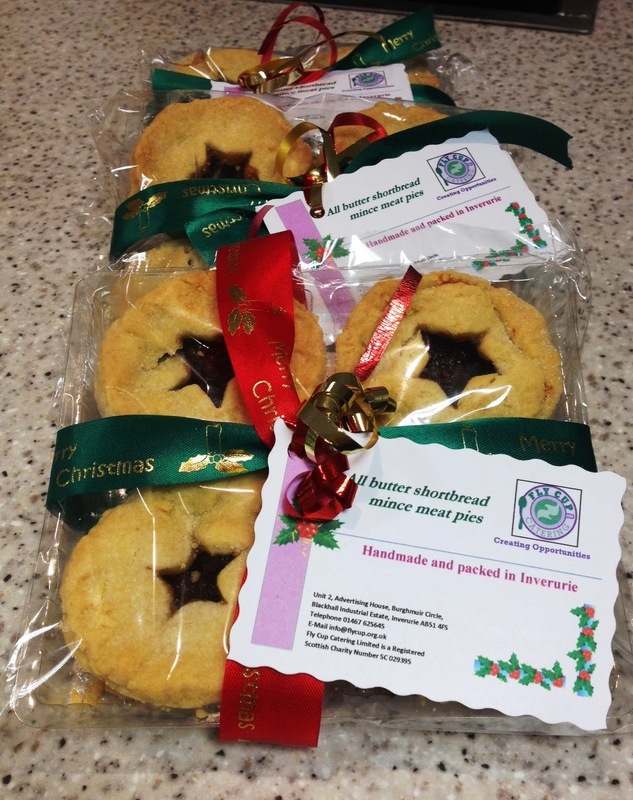 We are pleased to have already had an enquiry for next Christmas, some people are just organised !! 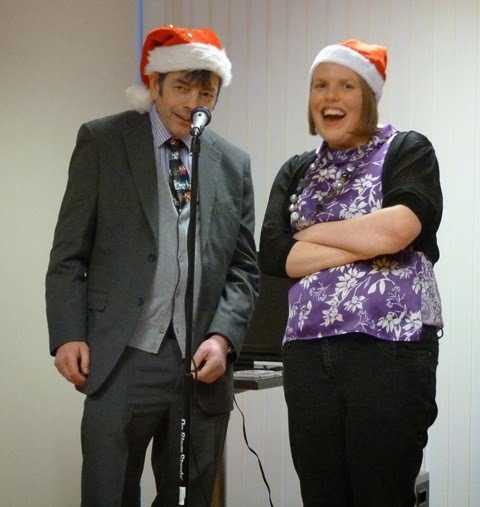 To end the news from 2013, I would just like to share some of the fun we had at our trainee Christmas Party. 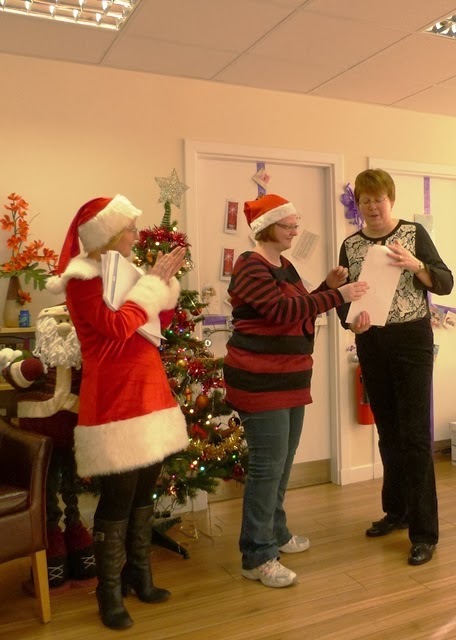 We started the proceedings by presenting certificates. Then the fun began, with finger food, a chocolate fountain with fresh fruit, live music and Karoke, and (of course) a visit from Santa ! No need for words I think the pictures speak for themselves. Albeit to say a jolly good time was had by all !! As so to 2014 - and forward thinking. Hot Cross Buns, ready for Easter. We have all got straight back into things since returning from Christmas break, the coffee shop opened on 8th January and surprisingly we have had a steady stream of customers, and quite a few who have not been to Fly Cup Coffee shop before. The bakery was back to normal straight away with all our regular customers re-stocking their shelves with tray bakes and shortbread. The Kitchen has not been quiet so busy with outside catering events, allowing us to spend a little time on planning ahead, in particular thinking about celebration events, such Burns, Valentines day and Easter. Next week we will be celebrating Burn with Haggis, Neeps and Tatties on the menu, with a taste of Scottish Tablet to finish off. 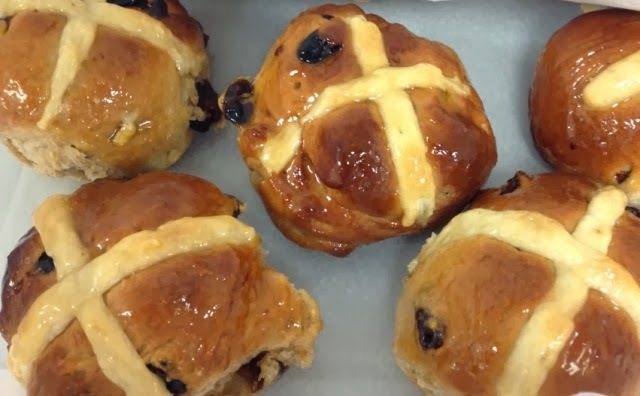 And, although a little early, the bakery have started to prepare for Easter and this week we added Hot Cross Buns to our coffee shop menu. Following my last "Natter" we have had some lovely gifts and donations from customers visiting our coffee shop also companies who want to support a local charity. 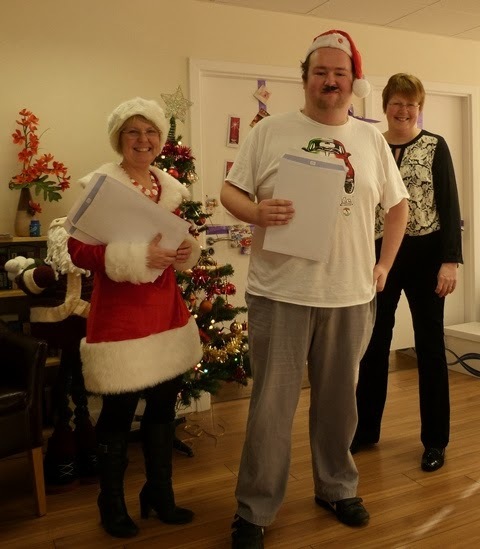 Such as, Poundland (Inverurie) who donated 25 Christmas hats for our trainees Christmas party (see pictures above). 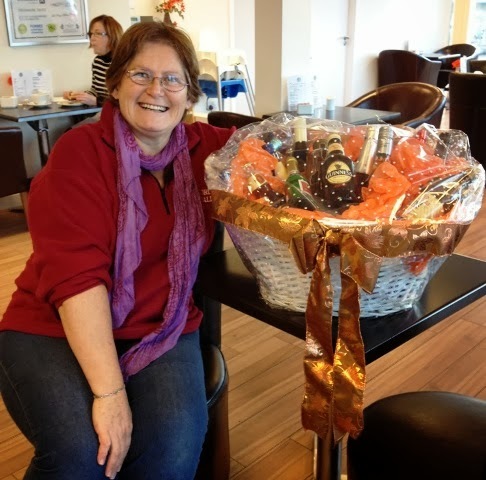 The donation of the Festive Cheer hamper from Keri's gran, raised £223.00 and was won by customer Gaynor. A music center for the trainee staff room from Mrs Mellis, a customer in the coffee shop who read about our need in the last "Natter". Thank you. 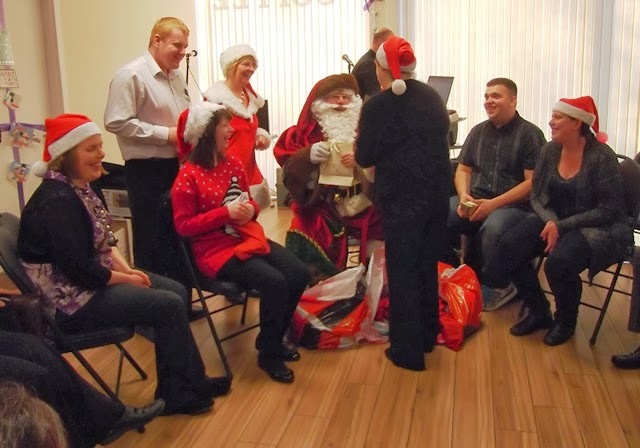 Tor Ecosse (Thainstone) raffled off Christmas gifts to staff and donated £85.00. A friend of mine (Jenny) didn't send any Christmas cards and instead handed me a cheque for £50.00 this week, the money is going to be used to purchase new aprons for the team in the coffee shop. In my last "Natter" I mentioned that we had a grant from the Garioch Charity Shop for baby changing facilities and equipment. Being frugal, we were able to buy all the equipment without spending the full amount and with the permission of the Charity Shop Directors, I was able to buy a new set of Whites for all the trainees and staff in the kitchen. As part of their corporate social responsibility objectives, Langstane Press embroidered the logo onto all of the uniforms free of charge, everyone looks very smart and we appreciated their contribution. And finally, last but not least, World Duty Free at the airport, who support us regularly offered their customers a gift wrapping service and donated the proceeds to our fund. We thank each and everyone one of you for your support.! As reported in the last "Natter" Santander awarded Fly Cup Catering funding of £20,000 during the autumn of 2013 towards staffing costs for one year. I introduced June in my last edition, since then we have been joined by Claire who got straight into things helping in the coffee shop and floating around the kitchen in the lead up to Christmas. Claire has been working four days a week during the busy part of the day and those of you regularly visiting the coffee shop will be getting to know her well. A great addition to our team, welcome! Volunteers are important to Fly Cup and we could not do as much with our trainees as we would like, without them. Consequently, when we have a unexpected volunteer they are most welcome. This was the case when following my plea for help at our bag pack a Facebook follower, Lesley turned up at Marks and Spencers in December. Although I haven't seen Lesley since I heard from her mum that she had enjoyed the experience very much. Not surprising, if you like to people watch, the occasion and shopping habits of people on the Monday before Christmas was fascinating. Thank you Lesley for your help, we look forward to your continued support during the year with our fundraising objectives. If you or any of your friends would like to volunteer with Fly Cup I would be delighted to discuss opportunities with you, from basic dish washing, supporting our trainees in their activities, helping with outside events, being part of our fundraising team, or helping with administration tasks. 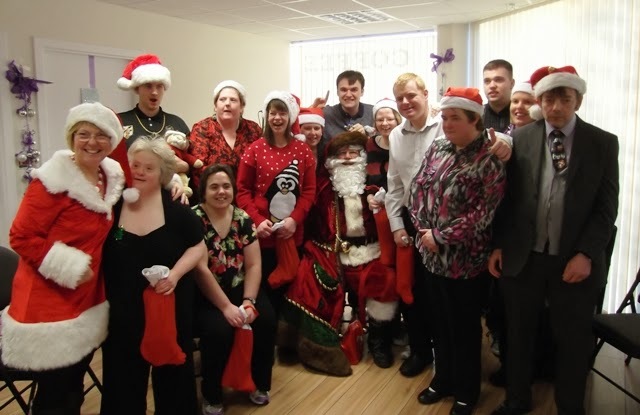 During the past year we have been fortunate to be the chosen Charity for the team at Marks and Spencer's (Inverurie). 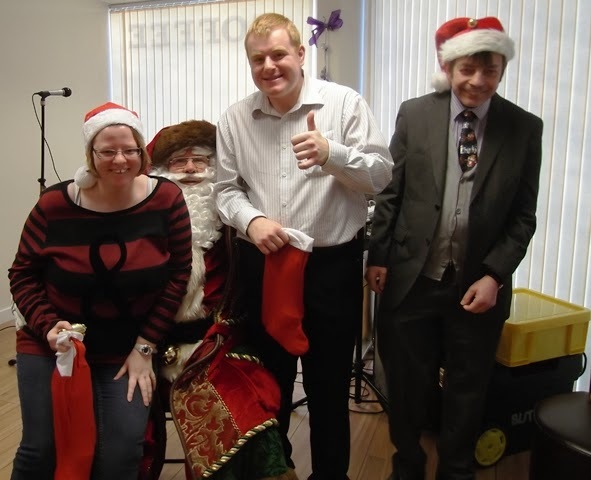 Julie and her team at the store have organised a number of events and raising money in a variety of ways. Over the coming weeks Julie and her team are organising a Bingo Night and a Quiz Night, both are being held here at Fly Cup, with refreshments included in the ticket price. Preliminary dates are Friday 31st January or 7th February and 30th March. In addition, there is a bag pack planned for 1st March. If you would like tickets to any of the events, or can help with the bag pack, PLEASE let me know as soon as possible. Spring is looming, the snow drops are starting to put their white heads up in my garden, the team here at Fly Cup look forward to welcoming old friends and new customers in our coffee shop, new retail customers around the area, and to delivering a range of new products, we look forward to having you along for the journey. Until my next "Natter" take care of yourselves and if in the cafe remember to say hello to me. or if you are not bothered about modern technology then just ask for a paper copy (printed courtesy of Semco Maritime UK, Aberdeen) from any of the staff when visiting the coffee shop or phone me on 01467 625645. Why “Natter”, because it’s what I do well!! 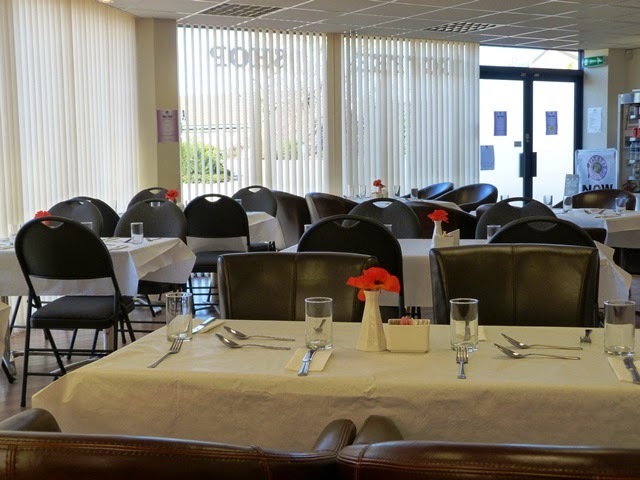 and it is one of the lovely things about Fly Cup Catering, you can come and have a cuppa and a natter in comfortable surroundings and there is always someone willing to chat. 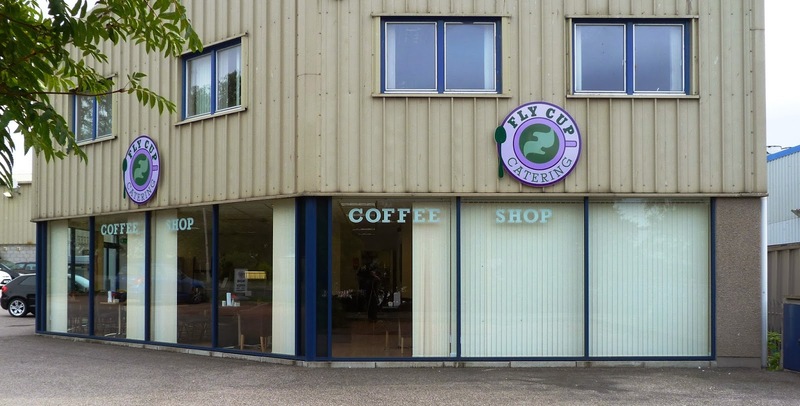 This Newsletter is the first of what I hope will become quarterly reports to inform on the news and updates about the team and business at Fly Cup. The “Natter” is intended to be read by anyone who is interested in Fly Cup Catering so feel free to pass it around. Your comments, feedback and input will be gratefully received. Welcome to edition 1. Many of you will know that I have now been Business Manager at Fly Cup Catering for four months, how quickly the time has passed. I do feel that I am now settled into the office vacated by Louise earlier this year, but I still have a lot to do and learn about the business, the staff members, the trainees and those who live with and care for them. The team at Fly Cup Catering and the customers have made me welcome, thank you. 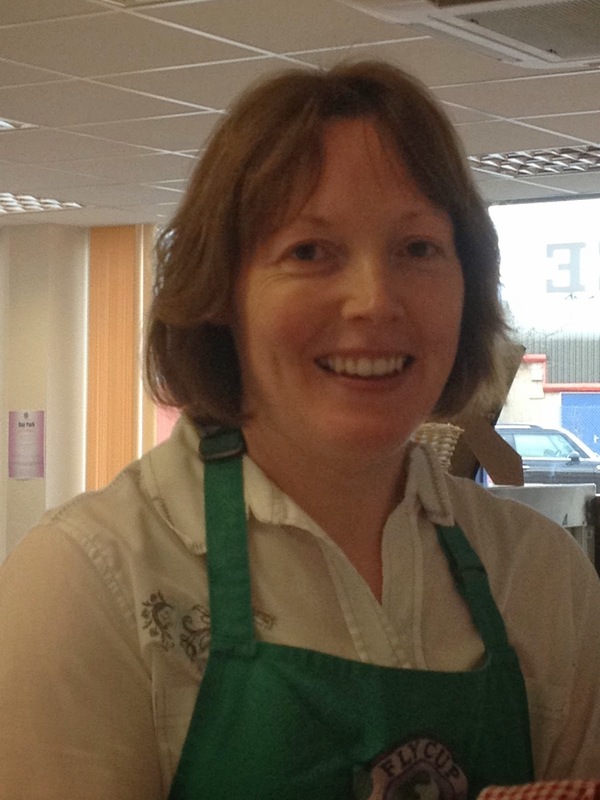 Louise is now settled and working for Children 1st but she visits the coffee shop regularly, and is often surrounded by members of our team who manage to spy her from the kitchen. 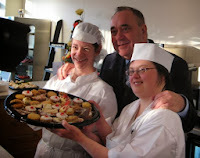 During the past year or so, there have been a lot of changes, including the move to this lovely new building, thanks to Louise who worked hard to get everything in place for the opening in February by Alex Salmond. Despite, the changes the team has continued to work hard to keep our regular customers supplied with their products on time, as well as keeping the coffee shop open and stocked with scones and home bakes. Past customers are finding their way to the new coffee shop and with the help of some promotions in the New Year we hope that Fly Cup Coffee Shop will be the "place to come" in Inverurie for a (what else?) FlyCuppa! The place to meet for a "Fly Cuppa!" The outside bakery aspect of Fly Cup Catering is also on the increase. 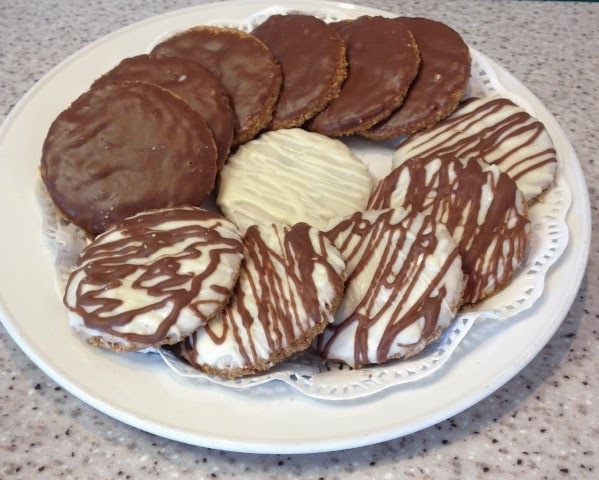 In addition to our longer term customers who purchase our tray bakes for retail, we are delighted to now be preparing and delivering sandwiches to a retailer in Tarves three times per week, soup to Strachan's in Inverurie who retail it in their coffee shop and French's in Methlick have become a regular customer for tray bakes. With the Inverurie Sweet Boutique being our most recent customer. We thank all for your custom. "Hi Denise, Just a wee note to let you know how marvelous the Fly Cup crew were today. A pleasure to work with. The food was wonderful, and piping hot and as a result most plates were cleared !. Thank you for your support and co-operation..."
A huge well done to everyone involved in that event and all the numerous others that we prepare and deliver on a daily basis, too numerous to mention. We are getting busy with bookings for Christmas lunches, with turkey on order, potato peelers at the ready, sprouts on the boil and the stuffing in the capable hands of Nicola, the menu includes pate, soup and a desert of Mincemeat pies or winterberry cheesecake. We are looking forward to welcoming community organisations to our premises including Grampian Opportunties and The Volunteer Centre. There are still a few vacant seats but booking is essential so don't delay, call today! 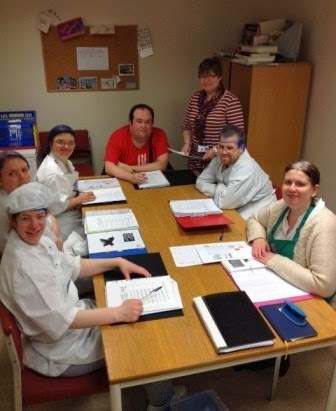 In addition to the growing catering and coffee shop customers we continue to look for grant funding to support our charity and the work we do here with the trainees at Fly Cup Catering. During September I was delighted to go along with Kirsty and Yvonne to a cheque award ceremony from Garioch Charity Shop. The award of £1000 was made to Fly Cup to enable us to install baby changing facilities and provide additional highchairs and some toys, the remaining money will be used to purchase equipment that will aid the trainees in their learning activities here at Fly Cup. I am also please to report that during the past month Santander announced Fly Cup Catering as winners of a prize worth £20,000.00. The award was made for the work that we do and the difference we make to the lives of everyone who is associated with Fly Cup. Each of us contributed to this prize, which has been given to fund additional staff, and allow us to increase the number of trainee places we offer, and to support us in our endeavour to increase our product ranges and customer base. As an additional fundraising initiative we have been raising funds in-house and anyone visiting the coffee shop is able to purchase raffle tickets for a prize draw. The current draw is for a huge hamper of Christmas Cheer! Tickets are only available on-site at £2.00. Money raised from in-house fundraising is used to enhance the work environment of all our trainees. For example, it came to my attention that one of the things the trainees would like is music in the kitchen, to quote "It makes us work harder"!. The in-house fundraising has allowed us to purchase a music licence, we have an old CD player in the kitchen, but will continue to fundraise for a nice modern unit in the near future. Marks and Spencers announced Fly Cup as their chosen local charity this year, and their staff have been organising fundraising events on our behalf, more of that in my next "Natter" but in the meantime look out for us bag packing in store on 23rd December. If you want to volunteer let me know soon, your help would be gratefully received. The staff and volunteer team. June and Rachel having fun ! she was immediately introduced to the famous Fly Cup Catering Shortcake Mince Meat Pie, and is now queen of pies assisting the trainees making the products which are for sale on-site and for Christmas orders only. Let us know as soon as you can your requirements, for collection no later than 20th December. In addition to June, we have this year welcomed Mandy to our team, many of our customers now recognise Mandy who is constantly in and out of their doors delivering retail products and buffets. Some of our trainees take turns in going along with Mandy who much appreciates the extra help. Unfortunately, Sandy resigned from Fly Cup just after I started, she is sadly missed by everyone but she pops in regularly to see us. 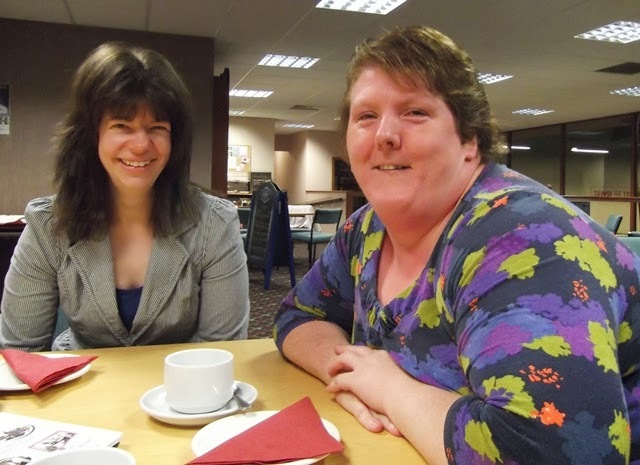 However, this week I was delighted to meet Joanne, who has been on maternity leave since June. She gave birth to a little girl and the whole family are doing well. I was glad to hear that she is intending to return to work at Fly Cup at the end of spring 2014. I know we will look forward to seeing her again. Our volunteers are important to us, as we would not be able to do the work we do, or give the trainees the support they need without them. I will not name them all here, they know who they are, but we are grateful for their time and support. 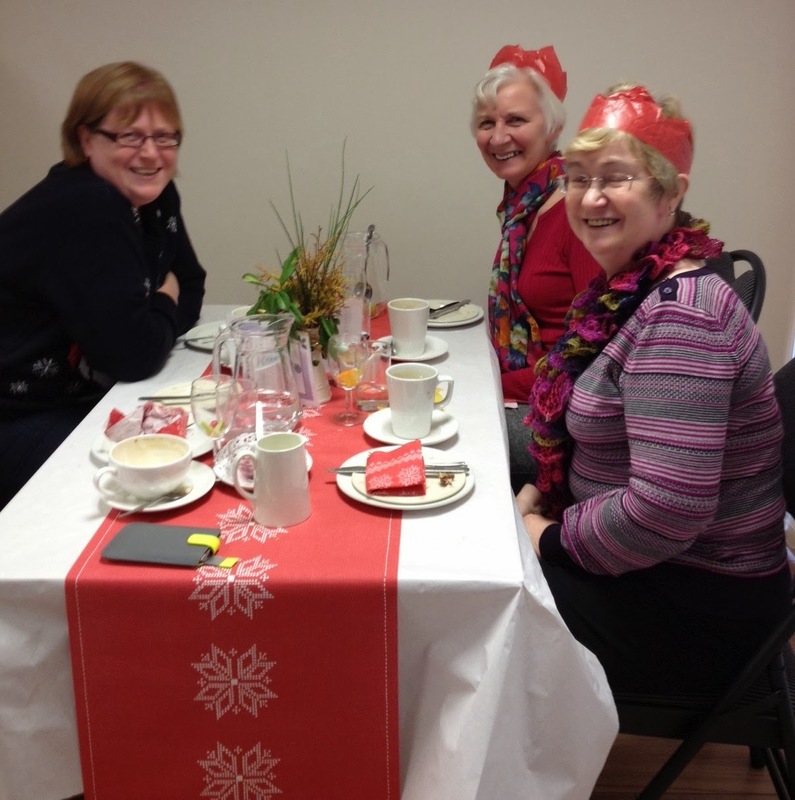 Maybe a picture in the next "Natter"
Following the public Christmas party lunches we will be hosting a trainee Christmas Tea Party at the coffee shop on 19th December after which we will be closed until 8th January. Staff will be returning prior to that for on-site training, planning and preparing much needed orders for customers. Please remember that Fly Cup is the cafe in the community for the community and we look forward to welcoming old friends and making new ones in the coming months and years. Please share your enthusiasm for Fly Cup with others and suggest they follow us on facebook www.facebook.com/pages/flycup-catering or you can follow me at twitter @flycuppa . visit the website www.flycup.org.uk. You are welcome to e-mail me manager@flycup.org or Carol info@flycup.org.uk. If you prefer a human voice then call us on 01467 625645. I would like to thank each and every one of you for the support and customer during 2013, and to everyone at Fly Cup Catering and everyone reading the "Natter" may we wish ourselves and each other a very happy Christmas and look forward to a prosperous and happy 2014.